In recent years there has been a fierce debate over whether Islam is inherently more violent than other religions and whether the perpetrators of such atrocities as the attack on 9/11 and the shootings at Paris and San Bernardino are extremists who have distorted the peaceful teachings of Islam or devout Muslims who are obeying the precepts of their god and prophet. I lean very heavily towards the idea that Islam is an evil and violent ideology, responsible for more misery and destruction than such comparable ideologies as Nazism and Communism. I shouldn’t have to add that I do not believe that all, or even most, Muslims are evil and violent. There is about the same proportion of good and evil among individual Muslims that there is among any population. The problem is not that individual Muslims are worse than other people. They are not. The problem is that they follow a religion which encourages violence and Islamic supremacy. This could perhaps be illustrated by this article I read from something called the TSEC Network, which I found courtesy of Jihad Watch. Are Muslims who live in Canada living in a state of war with their host country? Should they see other Canadians as the enemy? The Ottawa Public Library (St. Laurent Branch) is currently holding books by Mohamed el-Ghazali, one of the most extreme of Islamcist writers who preaches violence and hate towards non-Muslims and Muslims who do not live according to his extremist view of Islam. If you are a Muslim living in a non-Muslim country, then you are in a state of war against your host country. If you are a Muslim living in a non-Muslim country, then you are living with the enemy. Only a caliphate is an acceptable form of government. If you kill the takfir (non-Muslim/apostate) then you will go to paradise. Women cannot work. Nor can they leave the home without permission. You must kill those Muslims who leave the faith. Christians have no rights and cannot be allowed to construct churches etc. Of note, a search of books on Islam at the St. Laurent branch revealed more violent texts including others by el-Ghazali. There were no books there that expressed a historical view of Islam nor any books on the modernization of Islam. It is not known if this book was purchased by the Ottawa Public Library or if it was donated by an individual or a group. An informal conversation with a staff member suggested that books that were donated were subjected to a specific process and were approved for use by staff. Mohamed el-Ghazali is the author of more than 90 books. He became best known in the press for his public defense of the assassins of Dr. Farg Fouda. Dr Fouda was a secularist who spoke out against Islamacist organizations such as the Muslim Brotherhood and was killed because of this. El-Ghazali stated at trial that anyone who opposed the full imposition of Islamic law was an apostate and should be killed either by the government or by devout individuals. El-Ghazali, who died in 1996, was a well respected author in Islamicist circles such as the Muslim Brotherhood. He was a life long friend to the current senior cleric of the Muslim Brotherhood, Yusef Qaradawi. I have no doubt at all that the vast majority of Muslims in Canada and America do not subscribe to El-Ghazali’s views. Indeed, I suspect that many of them emigrated to North America to get away from people like El-Ghazali or at least from the consequences that his viewpoints have on any society in which they are widely adopted. The problem is Islam is that it doesn’t matter what they think. El-Ghazali’s views are in accordance with Islamic law. As far as Islamic law and doctrine are concerned, El-Ghazali is in the right, and the moderate Muslims of North America are in the wrong, even if they happen to be a majority. The tenets of Islam, like the tenets of every other major religion, are not based on democratic votes or opinion polls, but on what the adherents of that religion believe to be divine revelation of one sort or another. As it happens, Islamic law does not encourage Muslims to live in countries not ruled my Muslims. The ideal seems to be that Muslims should either be the majority or a ruling minority. Islamic law and tradition does divide the world between Dar al-Islam, the House of Islam or Submission, and Dar al-Harb, the House of War. This does not mean that every Muslim should be at war with the non-Muslims or that there should be a state of perpetual war between Muslim and non-Muslim states. It does suggest a sort of with us or against us mentality that perhaps can be traced back to the origins of Islam and the period of time in which the Law was codified. In many ways, the advent of Islam was a beneficial and civilizing influence on the people of the Arabian peninsula. Among other things, Islam taught the people to look beyond the narrow interests of tribe and clan and work for the welfare of the entire Islamic community or Ummah. Unfortunately, Islam did not, like Christianity under the influence of the Greeks, come to consider the entire human race as one community. Instead, Islam just pushed the boundaries of us and them out to include the Ummah, and no one outside the Ummah. To this day, there is still a strong feeling among Muslims that they are the best people, blessed by God. If that is the case, then it follows that relations with those outside the Ummah, however friendly and profitable, must be viewed with a degree of wariness. They are potential enemies. Living in a state ruled by outsiders must then be rather like living in an enemy camp in time of war, at best opportunistic and at worst treasonous. It also follows that leaving the Islamic faith, apostasy, is akin to switching sides in a time of war, or again treason. If soldier deserts to fight for the enemy, it is very likely he will be executed. An Apostate is a traitor to God and so deserves execution. It is important to stress again, that few Muslims in North America, and perhaps not that many in other parts of the world, share the views expressed by such “extremists”. They are simply following the religion of their fathers without much thought, just as many modern Christians do not give much thought to the relationship between God and man in Christ’s nature or the relationship of faith and works. In fact, many Muslims may not know very much about the nature of their faith. Only about twenty percent of Muslims speak Arabic as a native language, and given that the Koran is written in rather an obscure and archaic dialect of Arabic, few can understand the verses they have memorized by rote without some sort of commentary. This is why hostility and discrimination against Muslims, even in the wake of such horrors as the recent attacks may not be a good idea. Hatred will only encourage the us against them attitude and confirm the idea that non-Muslims are infidel and the enemy. Instead, perhaps we should speak candidly and without hatred or malice about our beliefs on the errors of their system and try to show them that the way of Christ is a better way. After the terrorist attack on September 11, 2001, many of our political leaders took pains to assure us that Islam is a religion of peace. The nineteen men who committed the atrocities on that date were said to have followed an extreme version of Islam, a version not shared by the vast majority of peace loving Muslims. Many people, however, cannot help but wonder whether a religion whose adherents are responsible for most of the terrorism in the world today might not promote violence in its teachings. Being a religion with more than one and a half billion followers, contemporary Islam is of course very diverse. There are many, many Muslims who are indeed peaceful, and many who are not. How, then, can we determine whether the doctrines of Islam promote peace or violence? One way, might be to go back and look at the founder of the religion. After all, a tree is known by its fruits. The Prophet Mohammed in Arabia founded Islam more than fourteen centuries ago. To this day, Muslims look upon him as a perfect man to be emulated. Stories of his sayings and deeds, known as the Hadiths, are second only to the Koran as a guide to Muslim behavior. So then, learning whether Mohammed was a man of peace or of war should go a long way in determining whether Islam is a religion of peace or of war. 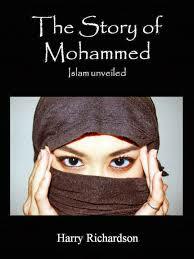 That is just what Harry Richardson has done with his book The Story of Mohammed, Islam Unveiled. Mr. Richardson tells the story of the life of Mohammed using Islamic sources including the Koran. Along the way, he shows how Mohammed’s example is used by terrorists to justify their actions. For, Mohammed was not a man of peace. He and his religion were peaceful enough when they were a small sect in Mecca. After the move to Medina, where Mohammed took power, the new religion quickly became very violent and intolerant. Under Mohammed’s rule, any atrocity or betrayal was justified if it furthered the cause of Islam. As Mr. Richardson shows, this same ends justify the means mentality is still used by all too many people in the Islamic world. Harry Richardson covers most of the same ground as Robert Spencer does in his books about Islam. I think though, that Richardson’s approach is more accessible than Spencer’s. He begins with the assumption that the reader knows little or nothing about Islam and explains the results of his own research referring to his sources. Although Mr. Richard may have begun his studies knowing little about Islam, he was clearly spent a lot of time and effort educating himself. He is also less confrontational than Robert Spencer often has been. I can strongly recommend that anyone interested in what is going on in the world of Islam read this book and then go on to read the Koran and other Islamic scriptures. If we are to prevent more attacks, we need accurate information about those who regard us as the enemies of Allah. Our leaders are not interested in telling us the truth about Islam, so we must educate ourselves. Harry Richardson’s book is a good place to begin. For the last two centuries, secular and skeptical scholars have attempted to learn about the “historical Jesus”, the actual person behind the Gospel accounts, and to develop a secular explanation for the origin of Christianity. This effort necessarily involves some degree skepticism about the traditional accounts of the life and words of Jesus and the apostles found in scripture. There has not really been much of an effort to find the “historical Mohammed” and to reconstruct the early history of Islam. The historian who wishes to investigate the origin of Islam suffers from two disadvantages that the historian of Christianity does not. First, while the evidence for Jesus’ life outside the New Testament is scanty, Jesus and the early Christians lived in a literate culture and the earliest Christians writings and non-Christian references to the new religion begin to appear within decades of Jesus’ death. Islam, on the other have, began in an almost completely illiterate, predominately oral, culture. The earliest written accounts of the life of Mohammed do not appear until more than a century after his death. These are largely those collections of Mohammed’s sayings and deeds called the Hadith, which were transmitted orally for several generations, and even Muslim scholars concede that many are spurious. The Koran is supposed to have been roughly contemporary with Mohammed, but there is good reason to suppose that it too was not collected until more than a century after Mohammed. The second disadvantage that the skeptical scholar of Islam faces is the fact that he literally endangers his life by making inquiries that the followers of the religion of peace disapprove of. For this reason, several scholars are obliged to use pseudonyms or invest in security. Less daring investigators prefer to study less dangerous subjects, such as the origins of Judaism or Christianity, whose followers are noticeably less inclined to murder them when they are offended. 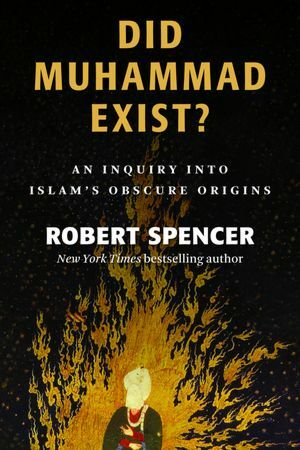 For this reason, we have good reason to be thankful that Robert Spencer is willing to take on the subject of the origin of Islam in his latest book, Did Mohammed Exist? Robert Spencer is not a scholar and offers no original research in writing Did Mohammed Exist. Instead, he has presented the works of those scholars who have questioned the traditional origin story of Islam in a clear, easily understood manner and convincingly makes the argument that Mohammed, at least in the sense of being the prophet from Mecca, did not exist. Did Mohammed exist? It may seem an odd question to ask. Surely, there is as much evidence that Mohammed existed as Jesus or Socrates. Even a non-Muslim must concede that, even if he does not believe Mohammed is a prophet. In fact, as Spencer shows, the evidence for Mohammed’s life is sparse. As I mentioned above, Muslim accounts of his life are not found until more than a century or more after his death. Non-Muslim chroniclers, although they describe the invasions of the Arab armies, make no mentions of the Arab prophet or of the Koran. Coins minted by the earliest caliphs are more likely to show Christian symbols, rather than quotations from the Koran. As for Mohammed, that name only appears a few times in the Koran. The name means “one who is highly praised” and could be a title rather than a proper name. While it is likely that there was a warlord or prophet with that name or title, the Mohammed of Islam almost certainly did not exist. Spencer shows that the historical evidence simply cannot confirm the traditional accounts. There is much that is contradictory in these accounts and there is much that does not match what is known of the conditions in Arabia in the time that Mohammed is said to have lived. It seems more likely, according to Spencer, that the legend of Mohammed and much of the religion of Islam was created, out of Jewish and Christian traditions in the first century of the Arab Empire as an attempt to provide an Arabic religious ideology to unify the diverse conquered peoples. Whether the reader ends up agreeing with Robert Spencer’s thesis or not, they are sure to find Did Mohammed Exist? A thought provoking exploration of the story behind the origins of one of the largest religions. Can Islam ever accept higher criticism? (blogs.telegraph.co.uk) Probably not. Since the Koran is viewed as the literal words of God, I suspect that Islam is far less flexible in scriptural interpretation. By now the burning of Korans by US forces in Afghanistan is old news, as is President Obama’s apology, although the rioting and killings continue. As far as I am concerned an apology would certainly have been appropriate if a delegation of Afghans had peacefully approached the commander of the US base and explained to him that this action was not appropriate, etc. But, that is not what happened. Instead, the Afghans began rioting, probably incited by the Taliban. Under such circumstances, no apology from any American is warranted or should have been offered. I think we need to make it very clear that desecrating a Koran does not justify taking the life of a single human being. In fact, the burning of a whole pile of Korans does not justify the murder of a single human being. To apologize while rioting is going on muddles the issue and tends to lend credence to the idea that the murders are justified. Not to mention making more dangerous for the troops serving there. I would like to add that if Muslims are outraged by the desecration of the Koran, well, I am outraged by the contents of this “holy” book. I am outraged by the misogyny, the anti-Semitism, the calls for violence against the unbelievers, the description of unbelievers as the worst of people, and many, many other ideas and themes of that book. As far as I am concerned, The Koran belongs on my bookshelf right next to Mein Kampf, although I will say that Mein Kampf was better written. I can’t tell the difference. Liberated is the name of a blog I learned about from Jihad Watch. The author is a woman who is a former Moslem. She lives in an unnamed predominantly Moslem country and has studied her religion and has decided that she could no longer believe in Islam. Since apostasy carries the death penalty in Islam, she cannot tell anyone about her decision. Perhaps I should let her speak for herself. I was born in a very typical Sunni Muslim household, not very conservative like the Arabs, but nevertheless religious enough. I was born in Karachi, Pakistan to a very respectable Mohajjir family (mohajjirs are immigrants from India from the time of the partition in 1947). I moved to another Muslim country with my parents when I was just 10 years old and still live there. I really wish there were a way I could freely live in a free society where I could follow the religion that I want without any compulsion. So far, I am not really sure what I am. I just know that I am not an atheist, because I do believe in a God, but that God cannot be the Allah of Mohammed. God is kind and merciful, not evil, cruel, mean and sadistic, as is Allah. Go read more of what she has to say and give her moral support. The reason I am bringing this up is because of a comment she made a little later in that post. Have you ever read the Quran in English? I never did, I mean all my life I just recited the Quran in Arabic without understanding a single word until August of this year, when I purchased a copy of the English Quran and read the translation for the first time. Previously I had read some parts of it in English, but never the whole thing. But this year in August I read it from cover to cover, and then also read other references on the internet. Then I finally reached the conclusion that this book is the most evil thing on the face of this earth. It teaches nothing else except hatred and violence. I can no longer be a part of a cult which subjugates its followers, making them mere blind puppets with no mind of their own. There is an interesting contrast between Christianity and Islam on the question of translating their scriptures. While Christians have endeavored to translate the Bible into every language on Earth (and off, some Trekkies with way too much time on their hands have been translating the Bible into Klingon), Moslems have generally resisted translating the Koran into any language other than Arabic. The main reason for this is that Moslems consider the Koran to be the literal word of God in Arabic. A translation into English wouldn’t be The Koran. At best, such a translation could only be a rough approximation or interpretation of the Koran. Only about twenty percent of Moslems are native speakers of Arabic. This means that although many Moslems have memorized large portions of the Koran and all Moslems use Koranic verses in their prayers, many have only the vaguest idea of what they are saying. I have to wonder how much of the Koran even native Arabic speakers understand. the Koran was written in the seventh century and languages change over time. The plays of Shakespeare and the King James Bible were written only about four hundred years ago and already they sound old fashioned. Thirteen hundred years ago, English was a dialect of Old German spoken by the Anglo-Saxon invaders of Britain. I suspect that Arabic has changed more slowly over the centuries, since they have the Koran as a standard, but it has still been a long time. I have read the Koran a number of times, in English translation, and I have even listened to recordings of the Koran being recited. When they recite the Koran, they do not just read it aloud, instead they chant the words, almost singing them. The result is compelling and more than a little hypnotic. I can understand why the Arabs of Mohammed’s time, with their love of oral poetry might have been attracted to the recitation of the Koran. When translated into English, however, I get quite a different impression. The contents of the Koran, when not vicious, are banal, repetitive, and incoherent. There is endless boasting by Allah on how great He is. There are curses and maledictions against the unbelievers and anyone who happens to have opposed Mohammed. There are stories from the Bible, or at any rate with Biblical figures, repeated with a maddening lack of any context. If the reader is not already familiar with the Hebrew prophets and Jesus, they would never know from the Koran who any of these people are. There are no distinguishing features for any of the prophets mentioned. They all have the same message, which happens to be the same as Mohammed. All of this material is given in no logical order. And, then there are the calls for violence against the infidel. I am not inclined to believe in a supernatural origin for the Koran. It seems to me more likely that a very fallible human being wrote it. If I were so inclined, however, I would sooner believe that a devil was responsible for this book than the almighty Creator of the universe. Today’s Quran in the light of its early manuscripts (paulmarcelrene.wordpress.com) This one is intereting since Moslems believe that the Koran is perfectly preserved from Mohammed’s time.